(Editor's Note: CPT Donovan has since been promoted to MAJ Donovan). I'm from Los Angeles, California and I am the oldest of four and first generation American. My parents are from Central America (Honduras and El Salvador). I grew up in East Los Angeles and in a low-income family. I am proud to have been raised in East Los Angeles. Family has always been at the center of everything we do. My grandmother, my parents, and my siblings are all I've ever had but they've been all I've ever needed to teach me the fundamentals of life. My father became a US citizen while serving in the US Army during the Vietnam War. His time in the Army was short but he always told us about his Army adventures. He introduced me to the service academies when I was 13 and suggested I learn about them. When I was accepted into the Naval Academy Prep School, he suggested I go into the Navy over the Army because "the Naval Academy had accepted women before the Army.” Of course, I went against his wish and chose to go to West Point. However, at the bottom of this, it was patriotism that truly pushed me to the Academies and to serve my country. My favorite song growing up was "Proud to be an American," - I still tear up listening to that song. I truly believe it and live it. My favorite quote is – “Ask not what your country can do for you, ask what you can do for your country." When I was 17, I reported to the United States Military Academy Prep School at Fort Monmouth, NJ. Two months later, 9/11 happened and I could see the smoke from NYC covering the sky as far out as New Jersey where I was. Shortly thereafter, I started at the U.S. Military Academy at West Point and now I have been in the Army for ten years this May. I commissioned as a Quartermaster Officer and progressed through the ranks to command a Maintenance Company. By my 8th year in service, I requested a branch transfer into Public Affairs and now serve as a Public Affairs Officer for a brigade. 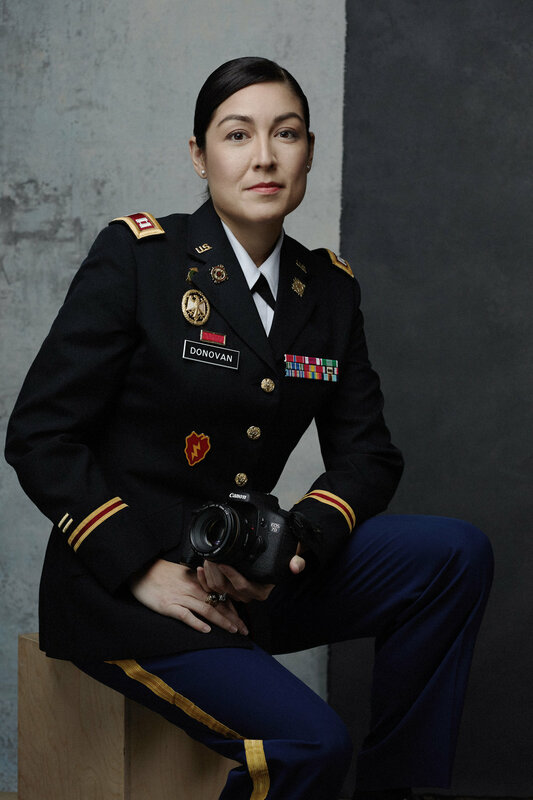 As a Public Affairs officer, I strive to tell the Army story and the story of our Soldiers and their families through writing and photographs. I also enjoy strategizing messaging for future Army concepts. I am married to an active duty Army officer and we have a daughter and yes, the struggle is REAL. Aside from our military careers, our family is the driving force behind everything that we do. We enjoy traveling and exploring new places. My favorite memory thus far in the military has not been a specific action or time. It has been the memory of the relationships I have had the opportunity to build throughout my time in the Army so far. The friendships are what have allowed me to make it through the tough times and have allowed me to enjoy the good times. I know that when this uniform eventually comes off, I will have the friendships and relationships that the Army has allowed me to make. Those are my favorite memories and make everything worth it. Why do you serve? For whom do you serve? I serve for many reasons but at the root of them all is one: I serve for the sacrifice my grandmother made when she migrated to the United States. My grandmother came to the US by herself, while leaving her seven-year-old son back in El Salvador. She was a live-in nanny in San Francisco until she could afford to bring her son (my father) to the US. Being a new mother myself, I cannot imagine her pain and struggle. I was very close to quitting in my second year at West Point. My grandmother was sick and I felt completely helpless 3,000 miles away. She passed away later that year and my world crumbled. But it was through this immense pain that she also gave me strength to not only complete that school year at West Point, but also the strength, ambition, and passion to finish my time at West Point and give back to the country that gave so much to her, my parents, and now my children. I want my legacy to be that of humility and gratitude for the opportunities I've been given. I also want it to be the one “paying it forward” and dedicating as much time and effort into the future generations of Soldiers because that is where I truly see our self-worth. If we hold on to our experiences and lessons learned without passing them along in order to allow future generations to be better, then we are no good at all.